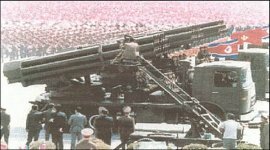 The North Koreans have produced two different 240mm rocket launchers, the 12 round M-1985 and 22 round M-1991. The M-1985 rocket pack is easily identified as it has 2 rows of 6 tubes and is mounted on a cab behind engine chassis. The M-1991 is mounted on a cab over engine chassis. Both launch packs could be adapted to any suitable heavy cross-country truck. 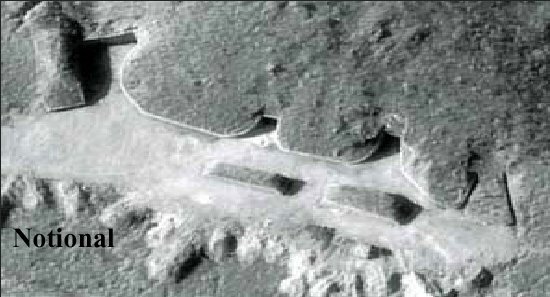 In the fall of 1993, in a conversation with the Deputy Assistant Secretary of the Army (Research and Technology), the Commander-in-Chief, Combined Forces Command (CINC CFC) stated that the North Korean 240mm Multiple Rocket Launchers (MRLs) posed a significant psychological and political threat to South Korea and the CFC. This weapon poses a significant threat, in that a very large number of 240mm MRLs are poised north of the demilitarized zone (DMZ) and are targeted toward South Korean urban areas and military targets. According to some reports, the DPRK has about 200 of these launchers in service. North Korea continues to improve its military. Highlighting these enhancements is an ambitious program to improve ground forces capabilities. A key component of this initiative involves the deployment of large numbers of long-range 240mm multiple rocket launcher systems and 170mm self-propelled guns to hardened sites located near the Demilitarized Zone. According to one report, a South Korean security analyst suggested that DPRK artillery pieces of calibers 170mm and 240mm "could fire 10,000 rounds per minute to Seoul and its environs." North Korea has about 500 long-range artillery tubes within range of Seoul, and the total rate of fire of thjese artillery pieces would be between 2,000 and 4,000 rounds per minute. The DPRK's two hundred 240mm MRLs fire either 12 or 22 rounds, providing a maximum single salvo of no more than 4,400 rounds. The Precision/Rapid Counter Multiple Rocket Launcher (MRL) ACTD (1995-98) demonstrated a significant enhanced capability for US Forces Korea (USFK) to neutralize the North Korean 240-mm MRL system. Because the 240-mm MRL is a mobile and fleeting target, it is expected to be exposed and vulnerable to counterfire for very short time periods. It is an extremely sensitive, time-critical target (TCT), requiring nearly continuous surveillance and nearly instantaneous target acquisition. The realities of terrain on the Korean peninsula require that a sensor be overhead and that target information be made available to the firing unit most capable of hitting the 240-mm MRL in the least possible time. A second-generation IR line scanner called the Reconnaissance Infrared Surveillance and Target Acquisition (RISTA II for second generation) was developed with an Aided Target Recognizer and Processor (AiTRAP). This system provides high-resolution, wide-area coverage, and automatic target chip presentation to a targeteer. Probably the most difficult challenge of the ACTD was integration: combining the data provided by various sensors and quickly transmitting it to the guns, missiles, and planes that would return fire against a North Korean threat. Program managers credit the ACTD with reducing the average time of response to a simulated attack by enemy MRLs from 15 to 20 minutes to 3 to 4 minutes, while significantly improving the effectiveness of the response. The Precision/Rapid Counter-MRL is a case in which battlefield commanders have kept residual operational capability without planning to acquire more systems through formal acquisition. That approach is appropriate because the prototype countered a threat specific to the circumstances facing U.S. forces near the Demilitarized Zone. In such a context, an ACTD may provide a quicker way to develop and field a unique capability than does the standard acquisition process, which is designed to ensure that larger quantities of a weapon system are built with consistent quality.